It's a very good thing I've been obsessing and dreaming about my house for the past 4 years because now the rubber is meeting the road and I'm having to make decisions FAST. The above photo is what I HOPE my kitchen will look like in a few months. 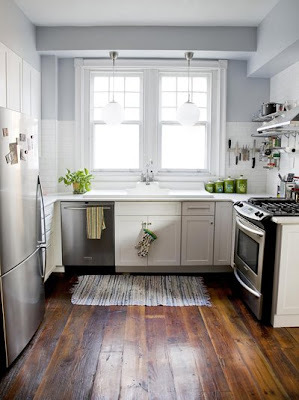 This kitchen is very similar to ours, and I am in love with this look. We've gutted the entire kitchen, cleaned and bleached out all the dead rodents and their accompanying poop, ripped up the subfloor to reveal wood floors that match the rest of the house (yay! ), and Jon is currently ripping out the 5000 nails that were holding the subfloor down. I have been trying to put my creative architect hat on all day to come up with the perfect layout, and I think I have finally got it. It came to me while Maddie Rae and I were driving up to Cincinatti tonight to pick up the boys from their weekend at my mom and dad's house. Unfortunately, it involves drywalling up the current dining room/kitchen door so the refrigerator can go there, and then knocking out a closet to create a new door. But, I think it will make the kitchen much more functional and fab. In the meantime, I'm going to go to one of those places where you can make all your meals there and take them home with you and we're going to eat on paper plates for the next few months! On a different subject entirely, our little sweet Dawn had her lip surgery and looks amazing! Dawn is one of the babies that our church in HK was able to sponsor for surgery with some of our earnings from the porcelain sale. Isn't she adorable?! We ripped our kitchen out one day before we're supposed to be moving in. It all started very innocently as Jon lifted up the oven to try to straighten a crooked tile. What he caught a glimpse of under the oven was what would change the whole course of our master "renovation plan" to not do anything hastily or rashly, but to take our time. When you lift your oven up and find dead mice and piles upon piles upon piles of mouse poop, there really isn't anything else to do but rip it all out. It got worse as we ripped and found the same revolting scene cabinet after cabinet. So here we are. No kitchen and moving in tomorrow. I have redesigned the kitchen, but of course the cabinets can't be delivered for 4 weeks. I guess I will be washing dishes in the bathroom for the next month. Terminix is coming tomorrow to spray for and kill anything that isn't human, and we continue the demolition tonight. Nothing like a little stress to come home to!! We spent the past weekend at Jon's parent's new lake house. They moved there while we were in HK, so this was our first time at the house. Maddie Rae met her Aunt Becca, Uncle Bobby, and cousins JD and Clara for the first time. Aunt Bec is so in love with her new niece, and I'm pretty sure Maddie Rae was very happy with all the attention too! A little swimming in the lake helped us cool off. Nana and Pappaw with 4 of their grandkids. Maddie Rae was still asleep. This is Maddie Rae's buddy. She loves her Pappaw. They have 2 kayaks that we paddle around in, and this summer Jack was finally old enough to go in one all by himself. Jonah and Pappaw took a few "speed boat" rides. It's really just a fishing boat, but Jonah thinks it goes really fast. The kids also fished, had water fights, made millions of crafts, had s'mores at an evening bonfire, and had soccer and wiffle ball games. Jack couldn't hold in his joy...he kept just saying, "I LOVE it here!" Everyone should have parents/grandparents who live at the lake!